More and more companies recognize that when people wish to buy a natural product, then they don’t want additives and other tricks that some of the companies use to sell a product under the natural label. 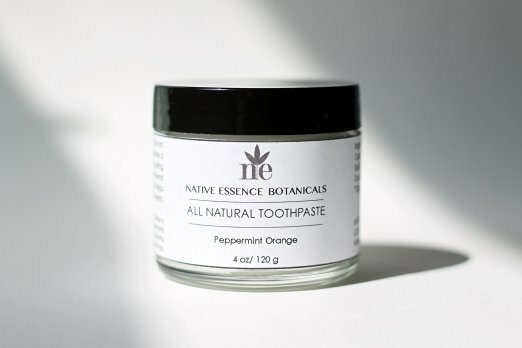 Native Essence Botanicals realize that, and they have dropped all the dangerous ingredients from their formula and create Natural Remineralizing Whitening Toothpaste with Coconut Oil, Xylitol, and Calcium. Toothpaste is packed in the jar. One jar is enough for 1-2 months if you brush your teeth two times per day. And the price for this magnificent toothpaste is very affordable. The company guarantees satisfaction and will refund your money if you don’t like their product. So you can be sure that this product is made with high-quality ingredients. Ingredients that will keep your teeth clean and healthy. And on top of all your teeth will be naturally white. Coconut oil is one of the essential ingredients in this toothpaste. Not only it is antibacterial, but it will help your teeth get a natural white color. Coconut oil was used for centuries in oil pulling method that many people from Asia use every day. Baking Soda or Sodium Bicarbonate is one of the abrasives in All Natural Toothpaste formula. It will clean your teeth from plaque and tartar. Calcium is used for remineralization of your teeth. But I m not sure if this ingredient will help in that and if at all you do need remineralization by washing your teeth with some kind of mineral in this case calcium. Xylitol was described many times on our website. It is sugar alcohol and at this moment we don’t have any opinion about it. Some researchers show it helps in teeth health, but there is no study about other influences on the human body. But we have written an article about sugar alcohols, so if you wish to read more about sugar alcohols go there. One thing we know is that your dog should not eat products with xylitol. I know chances that dog will eat this toothpaste are small, but it is better to say now than be sorry later. In other words, do not try to clean your dog teeth with this product. Caprylic Capric Triglycerides are a new ingredient on our list. I have first time see toothpaste with this ingredient. Derived from coconut oil this ingredient is antioxidant that will provide a silky feeling to the toothpaste. Peppermint Oil job is to make your breath fresh, and there is no better ingredient to do this job better than peppermint oil. Overall Native Essence Botanicals made an amazing product. They drop all the bad ingredients like fluoride, preservatives, artificial aromas, and SLS. The company is as well animal-friendly, and All Natural Toothpaste is a vegan-friendly product. Vegan-friendly means that no animal was hurt in the process of making this toothpaste, and there were no tests done on animals. I m euphoric to see that oral hygiene is going in this direction. But there are still too many companies that try to sell their toothpaste with SLS and fluoride under the label natural.